Option combinations may NOT reflect those shown in product photos. 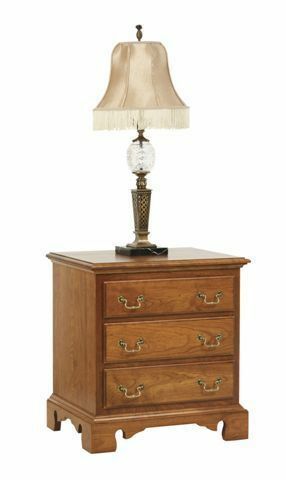 The perfect compliment to your Colonial bed, our River Bend Nightstands will bring that classic, Early American style to life, in any bedroom decor. Featuring a large top and three dovetailed drawers, supported by full-extension, side mounted slides, you'll be certain to have all the room you need for all of your bedside items. Add the sleek under-mounted drawer slides for a classic look that offers a soft-close mechanism that ensures you never slam a drawer and wake your partner again. Handcrafted from solid hardwood, each nightstand is bench-built with an heirloom quality that is sure to be a family favorite for generations to come. Choose the hardwood and finish option that best suits your decor, or go with our most popular Cherry Wood and Seely Finish for the look as shown. Quality Takes Time – Typical Build Time for This Piece is 4 to 6 weeks. *Please allow additional time for product transfers, finishing, and shipping. Thank you for your inquiry. We do our best to respond to all inquiries within 24 hours. If you do not receive a response it is likely an email problem. If this is the case, please call us toll free at 866-272-6773. Please note that many emails are captured by anti-spam software. Inputting your telephone number in the field on this page will insure that you get a response from us by telephone if email fails. © Copyrights 2003 - 2019 DutchCrafters All rights reserved.